Frame is made from standard galvanized steel and it is thick enough to handle force much more greater than stated in specs. There are 6 W-shaped support legs which support all jumpers withing weight limit, and much more… Steel frame is galvanized, meaning it is coated with protective layer of zinc to prevent rust. Also, all joints and connection points are reinforced with POD connectors (JumpKing version of T-connector from Skywalker). 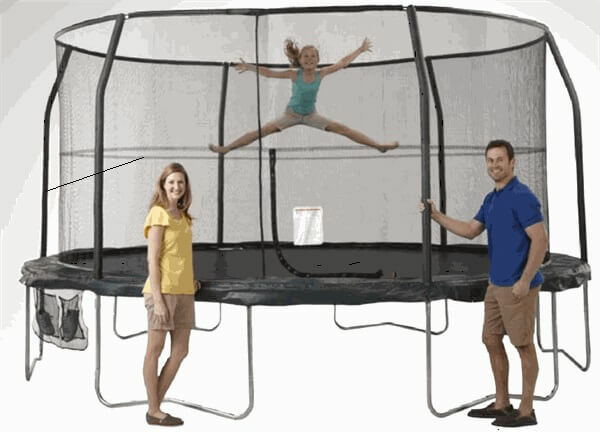 Trampoline mat is connected with 96 pieces of 7-inch springs, number which really surprised us! 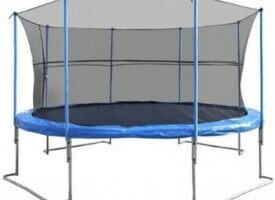 Finding 96 springs on this trampoline this size guarantees fantastic bounce experience. 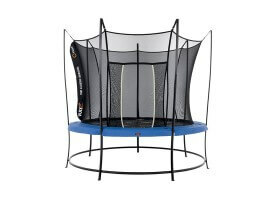 Also, setup in which some springs are lower and some higher is well known as bounce-booster, giving few extra inches of height. Enclosure has 8 supporting fiber glass poles which are covered with foam, adding extra protection for safe jumping experience. 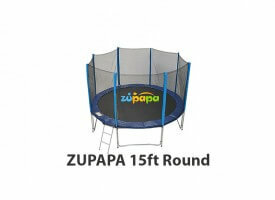 Entrance to the trampoline is secured with zipper and with buckles. Top of enclosure is reinforced with special top rail system, whichi adds extra sturdiness to the enclosure itself. 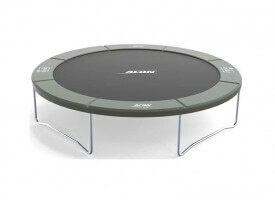 Check Season 2015 TOP Trampolines Buy Now! Good enclosure, fiber glass poles give an extra touch to it.